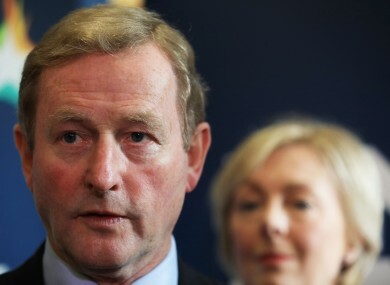 Enda Kenny at the Fine Gael think-in with the party's chief whip Regina Doherty. ENDA KENNY HAS criticised Fianna Fáil’s latest comments on water charges. In its submission to the commission, Fianna Fáil said it wants the charges to be abolished and the provision of water to be funded by general taxation. Party leader Micheál Martin has denied this is a u-turn. The introduction of water charges was part of the bailout deal Brian Cowen’s government signed with the Troika in 2010. The Taoiseach said he believes “very strongly” the country needs one body overseeing water infrastructure, stating Irish Water has “made huge improvements” to the quality of water of many areas. Kenny said the conservation of water is essential and he thinks it’s right people pay a “fair and affordable” contribution for an important resource that is scarce. Speaking at Fine Gael’s think-in in Kildare, Housing Minister Simon Coveney told reporters: “You wouldn’t expect Fianna Fáil to be proposing a new form of water charges in a submission to the expert commission. They’ve outlined a political position in my view, but they’ve also made it clear through their leader that they will consider, seriously, the outcome of the expert commission. Let’s not forget quite a number of the members of the commission are people who were recommended by Fianna Fáil. Most parties in the Dáil now favour the abolition of the charges. Right2Water, a group campaigning for the charges to be scrapped, said Fianna Fáil’s statement was the “first shot in protracted election campaign”. The organisation has sent its own submission to the commission, alongside various political parties. Right2Water coordinator Brendan Ogle said: “As the Government looks increasingly shaky, the decision by a resurgent Fianna Fail to call for charges to be abolished and our water services funded by general taxation in their submission to the expert commission is clearly the first shot in what is likely to be a protracted election campaign. Fianna Fail has belatedly recognised the popular demand for abolition and now it is time for all other parties in Dáil Éireann to follow suit. The group said it expects tens of thousands of people to attend an anti-water charges protest in Dublin on Saturday. Joan Collins, an Independents4Change TD, is to move a bill calling for a referendum to prevent any future privatisation of water services when the Dáil reconvenes later this month. Collins said her bill has the support of her Independents4Change colleagues, Sinn Féin, the Anti-Austerity Alliance/People Before Profit and “all 39 TDs who stood in the general elections on the Right2Change policy programme”. “This bill will pass if it is supported by Fianna Fáil who fought the election on an anti-water charges claim. We will now see how serious their claim was. Will they support the bill or will they hide behind the fig leaf of the commission on water charges?,” Collins asked today. The bill will most likely be debated in late October. During the interview earlier today, the Taoiseach didn’t rule out an inquiry into Project Eagle, the sale of Nama’s Northern Ireland portfolio. Kenny said he hasn’t yet seen a report into Project Eagle compiled by the Comptroller and Auditor General, due to be published this week, but Finance Minister Michael Noonan has briefed him on it. Yesterday, Noonan said there’s nothing in the report that “suggests there’s anything illegal, anything improper, or any irregularities in the way that Nama behaved”. A recent report in the Irish Times suggested hundreds of millions of euros were lost due to shortcomings in the transaction. Last week, BBC Spotlight aired a recording of former Nama adviser Frank Cushnahan accepting a £40,000 (about €47,250) cash payment from a Nama borrower in 2012. Opposition TDs have called for a public inquiry. Representatives from Nama are due to come before the Public Accounts Committee (PAC) on 22 September. Kenny said PAC should be given the opportunity to examine the report “before people jump to a point when you commit very serious amounts of taxpayers’ money” to an inquiry. An inquiry in the Republic would not be able to compel witnesses from Northern Ireland to attend. Junior minister John Halligan has been making headlines in recent days over his unhappiness that University Hospital Waterford (UHW) will not receive a second catheterisation lab, which specialises in examining the heart. Echoing comments he made yesterday, Kenny said Halligan should focus on the work he needs to do as Minister of State for Skills and Training. Kenny was speaking from his party’s think-in in Kildare. Email “Fianna Fáil's call for water charges to be abolished 'first shot in election campaign'”. Feedback on “Fianna Fáil's call for water charges to be abolished 'first shot in election campaign'”.